Born in the UK, couturier and founder Premal Badiani of Poshaac – Couture & Accessories has created the most elegant designs making a commendable contribution to the Indian fashion world as well as its international counterpart. Over the last few years, Premal has carved a niche for herself by revolutionized the bridal arena with her distinctively glamorous concepts, Indian and contemporary silhouettes, and exquisite craftsmanship. Her global design sensibility is a perfect marriage between exquisite embroideries and nouveau texturizing techniques, which are traditionally rooted; all of these in luscious color blocked palettes that define modern South Asian couture. 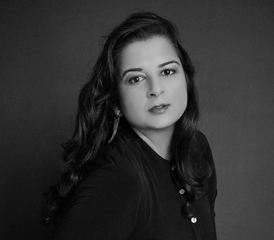 Being one of the most sought after designers for South Asian brides and grooms all over the world and the winner of the Style Icon Award, her work has been featured in various US and international magazines. Premal is also one of the favorites amongst the famous glitterati, including Miss. India USA, Miss. India Georgia, Ms. India NY, Mrs. Indian US International and Miss. North Carolina International to list a few. She was the official designer and stylist for Miss. India USA 2014 at the Miss India Worldwide pageant 2015.